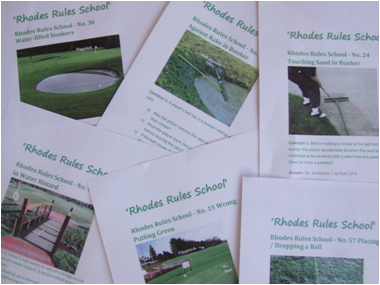 This week I am answering three questions that have arisen out of my free, ‘Rhodes Rules School’ weekly email series, which pose questions based on photos of situations that may be encountered on the golf course. (Click here if you are not already a subscriber). 2. A player's trolley unintentionally rolls into a hazard where his ball lies (propelled by the wind or gravity)! 3. Ignoring the etiquette issues - a player takes his trolley into a hazard (say a dry water course or even a very large bunker) and there selects his club! You are correct, there is no penalty in any of the three circumstances that you have outlined, and you have correctly identified that the reason is because of Exception 1 to Rule 13-4. The term covers all actions by which the player could gain more information about the hazard than could be gained from taking his stance for the stroke to be made, bearing in mind that a certain amount of digging in with the feet in the sand or soil is permitted when taking the stance for a stroke. This does not apply to any of the three circumstances that you describe. Of course, if you weren't sure that it was your ball you could move the divot, providing you followed the correct procedure of marking the ball and inviting a fellow competitor/opponent to witness the identification. But if did turn out to be your ball you would then have had to replace the divot as it was before you moved it. The position of the ball must be marked before it is lifted under a Rule that requires it to be replaced. Q. When marking the position of a ball, must the ball-marker be placed behind the ball, or may it also be placed to the side of or in front of the ball? A. There is no restriction. However, if a player positions his ball-marker in front of the ball on the putting green and in the process does something to the green which might influence the movement of the ball when played, e.g., presses down a raised tuft of grass, he is in breach of Rule 1-2. Placing a ball-marker in front of the ball is not recommended but it is not a breach of Rule 16-1a because this Rule permits touching the line of putt in lifting a ball, and marking the position of the ball is part of the lifting process. Learn the Rules and enjoy your game even more. Have you subscribed to Rhodes Rules School, a series of weekly emails where I use photographs to illustrate rulings regularly encountered by golfers on the course? If not, I recommend that you do so now as it is a great way to get to understand the Rules better. There is no charge (yes each issue is totally free) and you can unsubscribe at any time. Click here and join over 5,000 other satisfied subscribers. When in a bunker, on your take away while attempting your shot, you brush the sand, you hve inccurred a penalty. Correct? Yes, brushing the sand, or a loose impediment, on the backswing of your stroke in a bunker incurs a penalty of two strokes in stroke play or loss of hole in match play. Rule 13-4.
so if you are lying 2 in a bunker and brush the sand on takeaway and splash the ball on the green,what is the procedure and what are you lying? You would be lying 5 on the putting green and must continue playing out the hole from there; two strokes into the bunker, stroke from bunker, two penalty strokes for brushing the ground (sand) in the bunker on your takeaway. No, the Rules do not specify how the flagstick should be removed in this situation. The ball was correctly holed when the player moved the flagstick away from the ball and it fell into the hole. You have provided me with another myth on the Rules that I can add to my collection! Barry - if players, during a stipulated competition, play a different competition (e.g. stableford rather than a medal round, from the one on the fixture list, does this lead to disqualification, or can the scores be modified and used to enter into the results for the correct competition? Providing the player has entered their gross scores for each and every hole of the stipulated round the score card is valid for both Stableford and medal competitions. However, certain specific Rules governing stroke play are so substantially different from those governing match play that combining these two forms of play is not practicable and is not permitted, Rule 33-1. Thanks, Barry - very helpful. It was a stableford/sroke play situation that I was thinking of, not a match-play swap. Touching sand in bunker - penalty? Here's a real sequence from our club Foursomes Championships, a stroke event. In my opinion, the correct action here would have been that Team A/B incurred a two stroke penalty for a breach of Rule 13-4 and because none of the exceptions to that rule apply to these circumstances. Decision 29/5 deals with a situation that is quite similar (albeit in a match play situation so the penalty varies). Moreover, the marker should not have signed the card but reported the circumstances to the Committee. Team A/B should have been disqualified for signing for a lower score on a hole than their correct score. Would you agree with this assessment Barry? I agree. A&B should have been penalised two strokes for a clear breach of Rule 13-4. The marker, presumably C or D, should not have signed the card, without obtaining clarification of the ruling from the Committee. In my opinion, the Committee would have been justified in disqualifying both pairs for agreeing to waive the penalty incurred (Rule 1-3). P.S. Please address these type of questions to me directly at rules at barryrhodes d o t c o m.
Need a rule guide please...!! On a Sunday stableford comp I shot the game of a life time in a winter league comp, handicap 23.5 playing 24, I have come 3rd previously so docked 0.5 so now shooting 23. That's ok, had a few lessons and a few more beers the night before so was just chilled,shot a score of 47 points with 3 blobs...!! Played the 23 handicap but didn't write it on the card...!!
. If no handicap is recorded on his score card before it is returned (Rule 6-6b), or if the recorded handicap is higher than that to which he is entitled and this affects the number of strokes received, he is disqualified from the handicap competition; otherwise, the score stands. Now I interpret this to mean although now handicap was recorded but played to the score stands?? The disqualification penalty was correct. If no handicap is recorded on his score card before it is returned (Rule 6-6b)... he is disqualified from the handicap competition. There is something else! In most handicapping systems your score will count, even though you were disqualified.